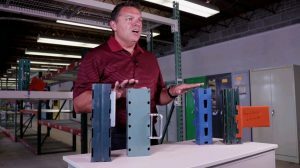 Today, we’re going to talk about alternative pallet racking to teardrop rack that could help you save some money. Check out our video and transcription below. If you’re ready to select the alternative pallet rack that works for you, visit our selective pallet rack pages. There are several alternative options to Teardrop rack, that are still roll-formed racking and have the same capabilities as Teardrop in most cases. Ridg-U-Rak Slotted-style uprights and beams require no clip to secure the beam in place. We have a large selection of Ridge-u-rack in stock and ready to ship today. Still very popular in the market today is a Keystone-style upright that also requires no clip to secure the beam, securing directly to the upright itself. We have a good selection of it available and ready ship. The next two styles of rack do require a clip to secure the beam to the upright. The first style is Speedrack style. We do have a lot of inventory available in the Speed-rack design at a lower price-point than you would see in a Teardrop or Structural-rack. The next style is a Sturdi-Bilt Slotted upright, that again, requires a clip to secure the beam to the upright. This is still a popular design today and we have a good inventory of it available as well. You may also consider T-Bolt style racking; very similar to the other Roll-form racking, but the beam actually bolts into the upright as the connection point. With so many great alternatives to teardrop, it could be difficult deciding which rack is right for you. Contact us today and we’ll help you select the right rack while stretching your dollar that much further.